Posted in Cooking & Nutrition on November 14, 2011. Last modified on April 02, 2019. Read disclaimer. Revered in cultures and societies throughout history, pomegranates are believed to be one of the first cultivated fruits. Most recently, however, pomegranate has been garnering attention for its potential to inhibit the growth of prostate cancer cells. Across time and cultures, pomegranates have appeared in artwork, literature, building designs, coats of arms and crests, coinage, clothing, furniture, jewelry and more. 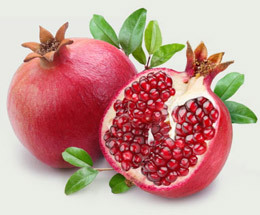 Generally believed to be native to Persia (Iran) and the Himalayas in northern India, pomegranates spread east from there, becoming one of the world's most popular fruits. They figured prominently in ancient Egyptian and Grecian culture. In Egypt the pomegranate symbolized the afterlife and was a favorite of pharaohs; in Greece, pomegranates were associated with the changing seasons; in Asia, the pomegranate was viewed as a symbol of fertility. Spanish missionaries brought pomegranate trees to the New World, where they were planted in Mexico, California and Texas. They spread from there; however, they grow best in semiarid climates with mild winters and hot summers. In North America, the majority of pomegranate varieties are in season from October through January, though some other varieties may be available as early as late summer. Because the fruit cannot be ripened after it's picked, pomegranates you purchase should be ready to eat. They should feel heavy with a firm skin. You can keep them for several days at room temperature and for up to three months when refrigerated in a plastic bag. Pomegranates contain red juice sacs (arils) which can be eaten plain or juiced. Arils and fresh juice can be kept for up to three-days in the refrigerator. For a future treat, arils can be frozen up to six months. To remove the arils, cut the fruit into sections and place in a bowl of water. Use your finger to remove the arils from the membrane; drain the water and enjoy! Vitamin C - One fruit contains about 16% of the daily recommended amount of Vitamin C. However, Order anytime 24/7, 365 days a year 1-800-991-7116 pre-packaged pomegranate juice doesn't feature this vitamin: the pasteurization process zaps it. Potassium - You can get about 5% of your daily potassium requirement from a pomegranate. Fiber - Pomegranate arils deliver about 10 grams of potassium per cup. However, the fiber is in the seeds so don't discard them if you want the extra fiber. Antioxidants - Pomegranate juice contains three types of polyphenols, which are a type of antioxidant. Antioxidants are credited with neutralizing free radicals, unstable molecules in the body that are linked to adverse health conditions. But pomegranates aren't just for eating! Dried fruits are often used in craftwork: centerpieces, wreaths and other decorations. To dry, place whole pomegranates in a single layer in a cool place for a few weeks, turning occasionally to avoid flattening. Thanks for your comment, Phil. From reading the Current Clinical Trials section of the page you mentioned, it sounds like quite a bit of research is under way. So, perhaps we will learn and hear more before too long.